Felicien Levesque was born in 1915 in L'isle Verte, Quebec He spent 40 years working for the same peat moss factory, first as a sod cutter, and then for 27-28 years as a mechanic. It was there that he learned the skills that would later allow him to produce sculptures with mechanical and electrical movement. He began carving in 1976 when he retired. He made painted carvings of birds, animals and people in every day situations as well as historical events. He continued to carve until his death in 1997. Felicien was well known for his carved men. They were always painted and had small pointed triangular noses, a rectangular trunk made of one piece of wood, and legs spread. The arms are attached to the body and they are often moveable. His earlier figure carvings sometimes featured articulated legs. Felicien often worked with found materials and he would sometimes use real or synthetic hair. His carvings are generally unsigned but are easily identifiable. Felicien Levesque is well represented in a number of important private collections, as well as in several public collections including the permanent collections of the Canadian Museum of History and New Brunswick’s Beaverbrook Gallery. 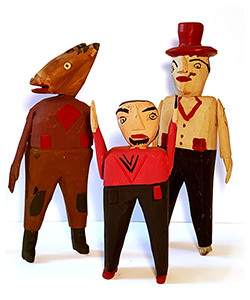 Ref: Les patenteux du Québec, De Grosbois, Lamothe, Nantel, 1978; Folk art: Primitive and naive art in Canada, Blake McKendry, 1983; Les Paradis du Monde, Pascale Galipeau, 1995; Canadian Folk Art from the Collection of Susan A. Murray, Bernard Riordon (Beaverbrook Gallery), 2007.